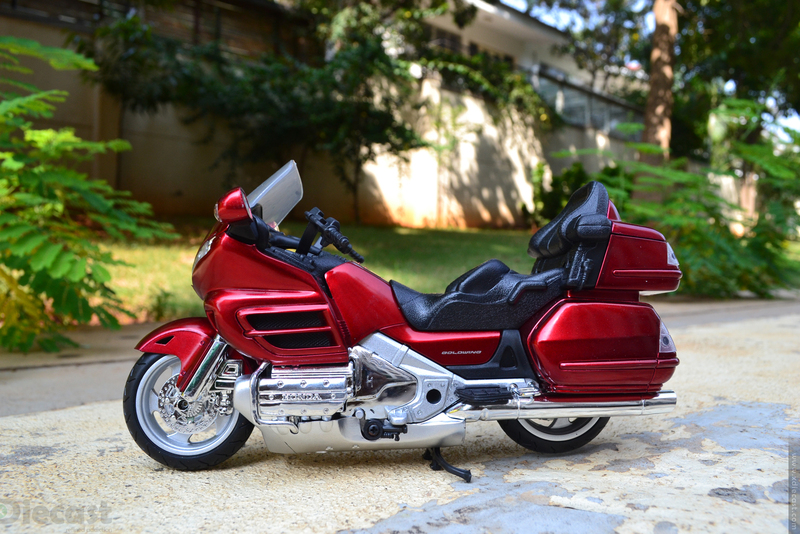 Honda’s Gold Wing is it’s flagship cruiser/tourer to compete with the big Harleys and Indians! The story is the same with NewRay when they decided to re-release this Gold Wing it is to fight the competition coming from Maisto’s Harleys! I always wanted to do comparison between these bike so got them both and parked them side by side!! 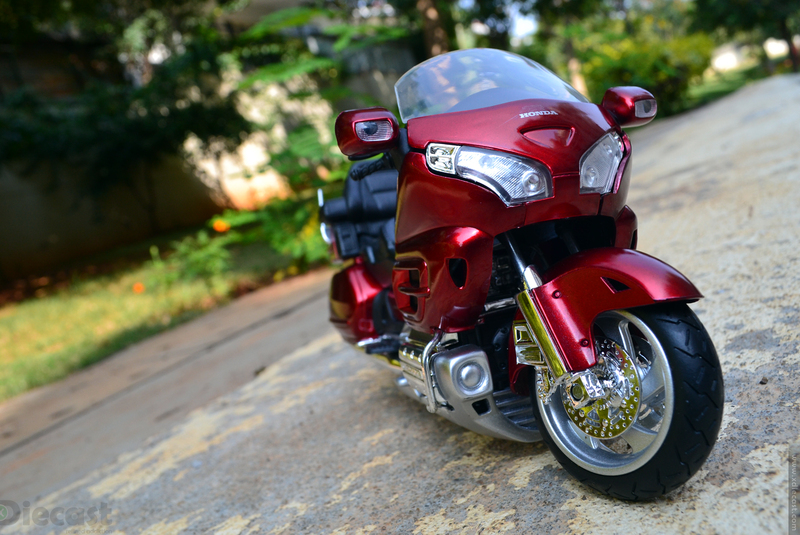 Ok coming back to this Honda Gold Wing, NewRay had done some awesome job in casting and also in paints department!! 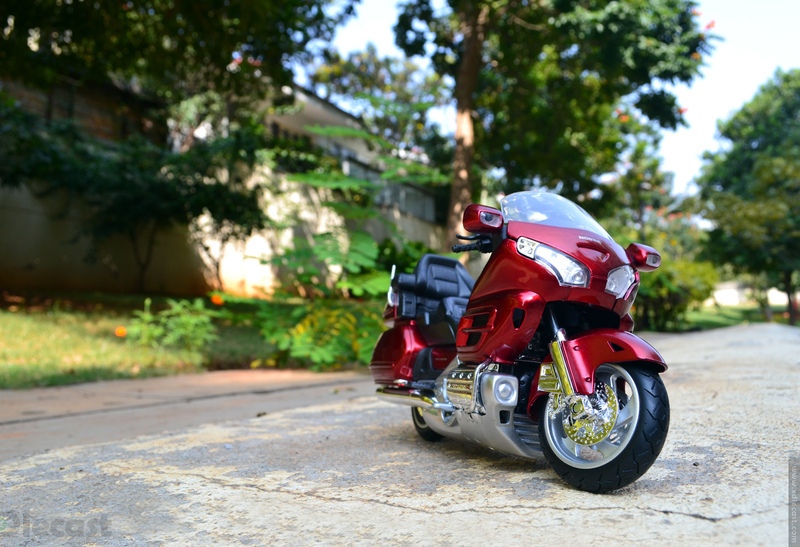 The packaging(only two screws holding the model together) is a little different too, read all about the package in my unboxing article here NewRay 1:12 Honda Gold Wing 2010 – Unboxed or read on to find out how this diecast motorcycle fairs! History: The Gold Wing is a series of touring motorcycles manufactured by Honda from 1974 to date. 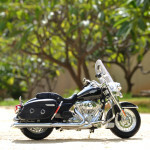 It is a popular model in North America, Western Europe, Australia as well as Japan. The first ever Gold Wing was powered by a 999cc liquid-cooled horizontally-opposed four-cylinder engine, producing 80hp. This model here is called GL1800(powered by a bigger 1832cc engine and frame made out of high-strength aluminium) and the production started in 2001 and succeed by the second generation in 2012 with minor updates. 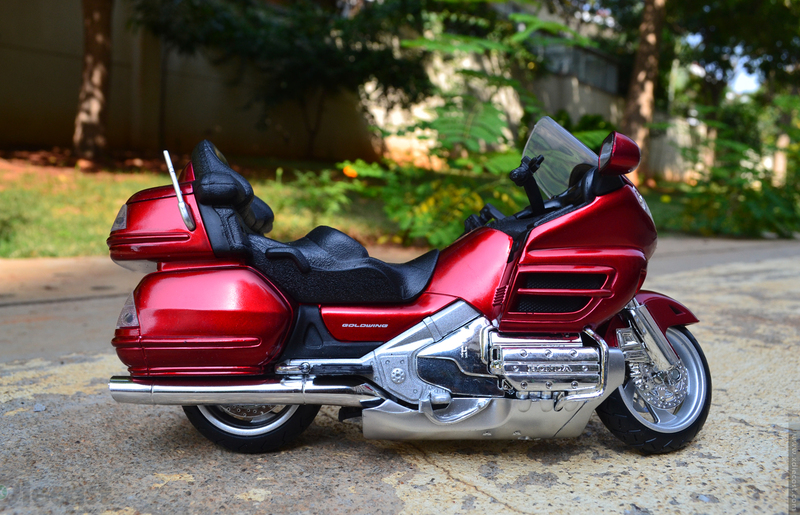 This very 2010 model is the last Gold Wing to be manufactured in US. This is by for the best best NewRay I have ever set my hands on… You might ask me why? Because I kind of love the mass that it holds and the fine details. 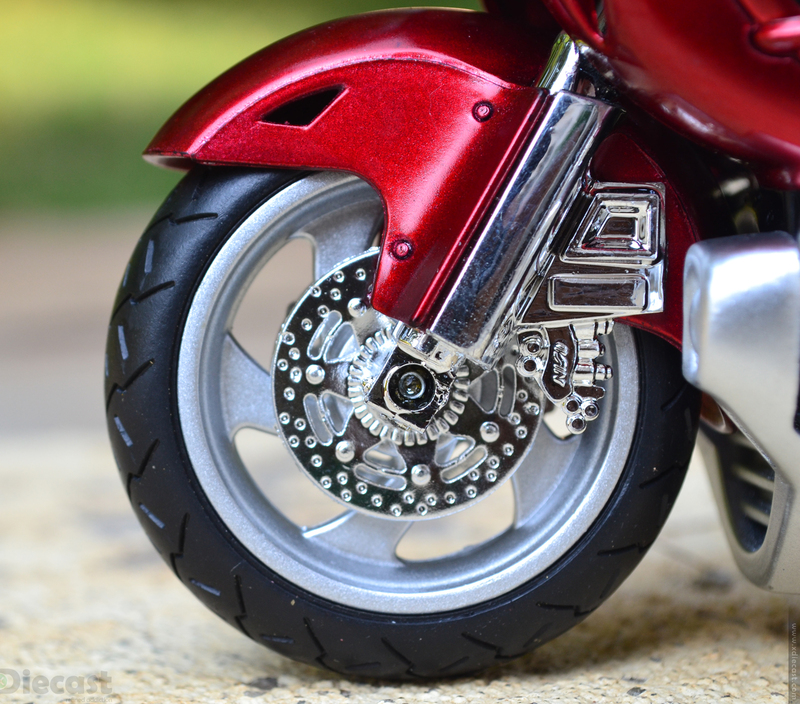 If the weight and fine-details of this diecast motorcycle adds value then comes the build quality to bring down the entire score down. 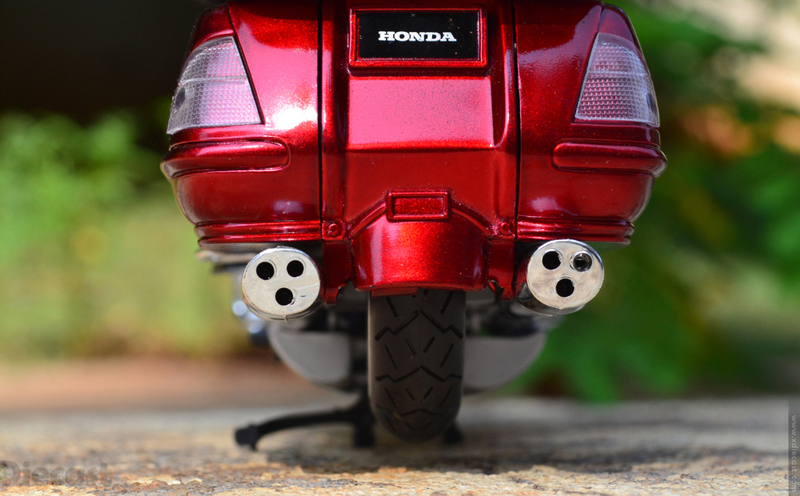 The profile of this diecast motorcycle is its main plus! 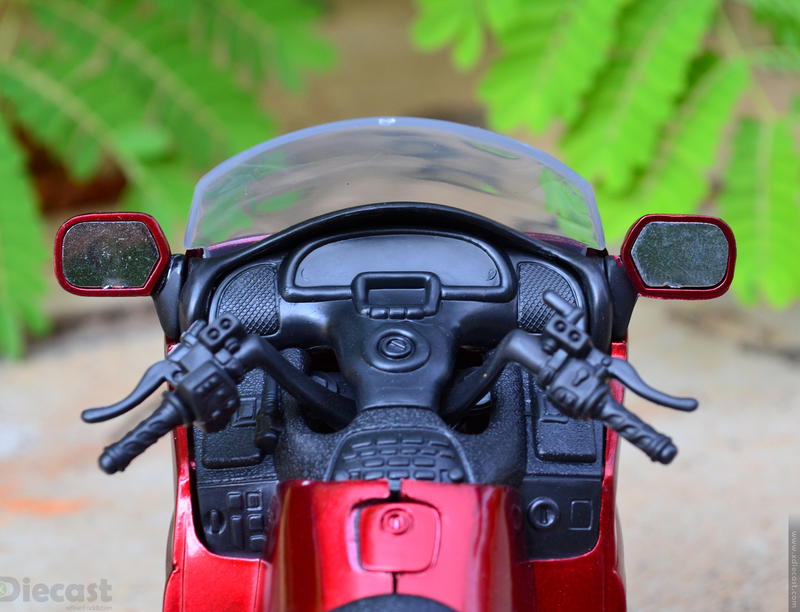 The original Gold Wing also has this advantage over many other tourers in this segment! This is humugus in the case and most of visitors think it is of a different scale! The guys at NewRay did some home work and gave us the option of having the motorcycle either on its kick stand of in its middle stand which gives exceptional display proposition. I kind of like the middle stand for profile view like the above one and the kick stand for those dramatic shot that I used for the main banner. 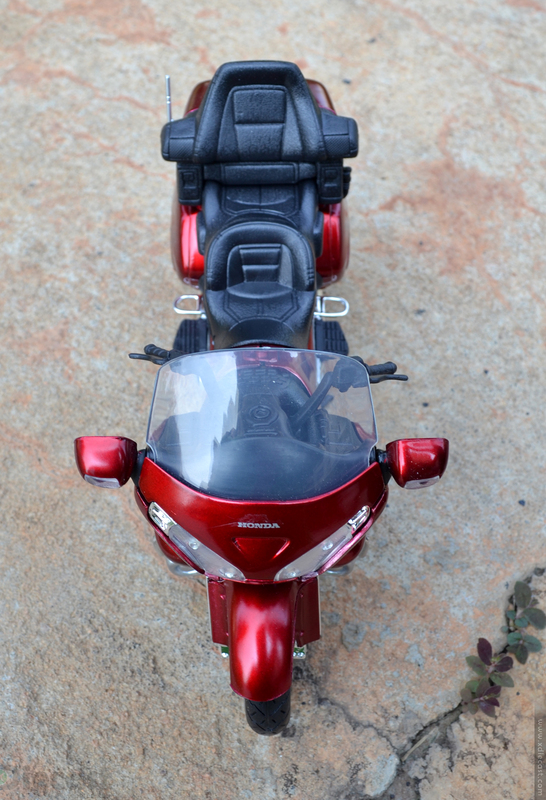 Aerial view reveals the bulk of the motorcycle, it also show the size difference between the seats and faring. I keep saying that this is a very nice model!! I like this Gold Wing’s fairing and the smooth lines that it has all around! 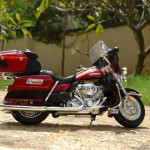 The other place I absolutely fall on ground for the front fender, wheels and brakes… they are gorgeous… see for yourself! And comment below. NewRay needs a kudos for doing an exceptional job here and the multi material adds that extra punch. The cruiser breed of motorcycles usually sport countless features that aids the rider in every possible ways… they usually come with ABS, cruise control, windshield height adjust and some big boys like this Honda and Harleys even gives you features like a entertainment units and Satnav as standard.NewRay’s Crafter have added alot of buttons and most of them are in right place! This Gold Wing gives you almost all the features mentioned above and the crafters in NewRay have added alot of buttons and most of them are in right place as is in the original bike. There button layout seems like its a random arrangement on first look but they are not… NewRay’s designer had done their home work and they have provided almost accurate details by providing knobs and buttons where they actually belong. 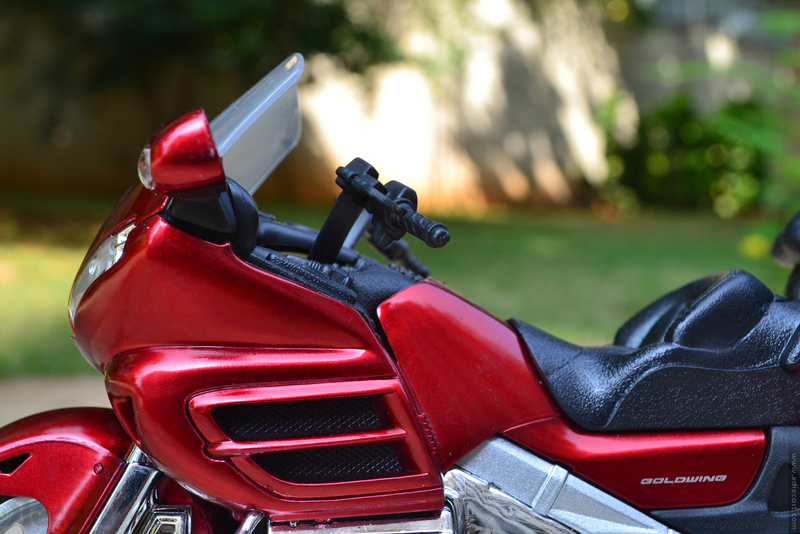 I have never seen a detailed handlebar in any budget 1:12 diecast motorcycle so far!! 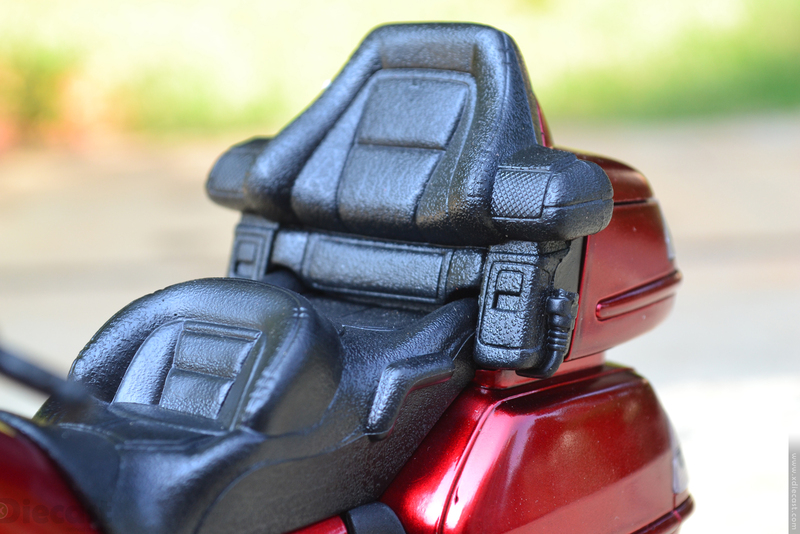 Once again the beautiful craftsmanship comes alive when you see these brilliant seats… They look plasticky for sure but the texturing is awesome, the details are nice like the step steats, storage spaces, the armrest for the rear passenger and the grab rails. The pattern on the seats are also nice and detailed. The detailed storage units gives this diecast Gold Wing some extra muscle. 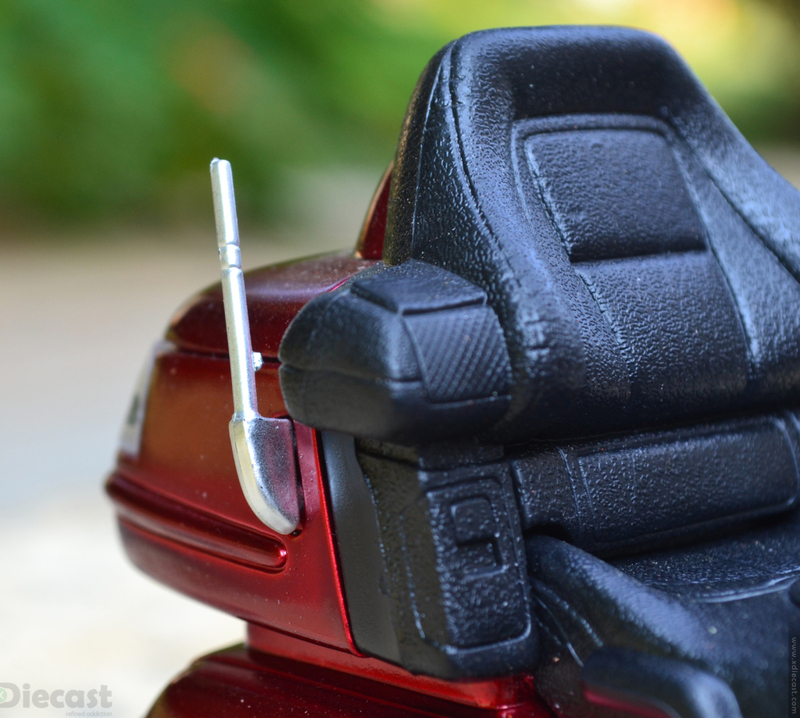 Even the smallest options like the radio antenna is not left untouched. Bigger is better is true in many context! 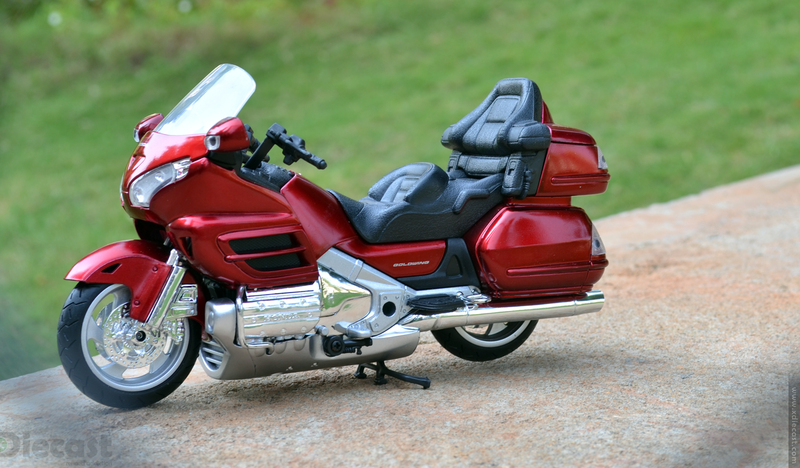 The same work well in cruisers territory and this particular Gold Wing by NewRay is one of the largest in my entire 1:12 motorcycle line. 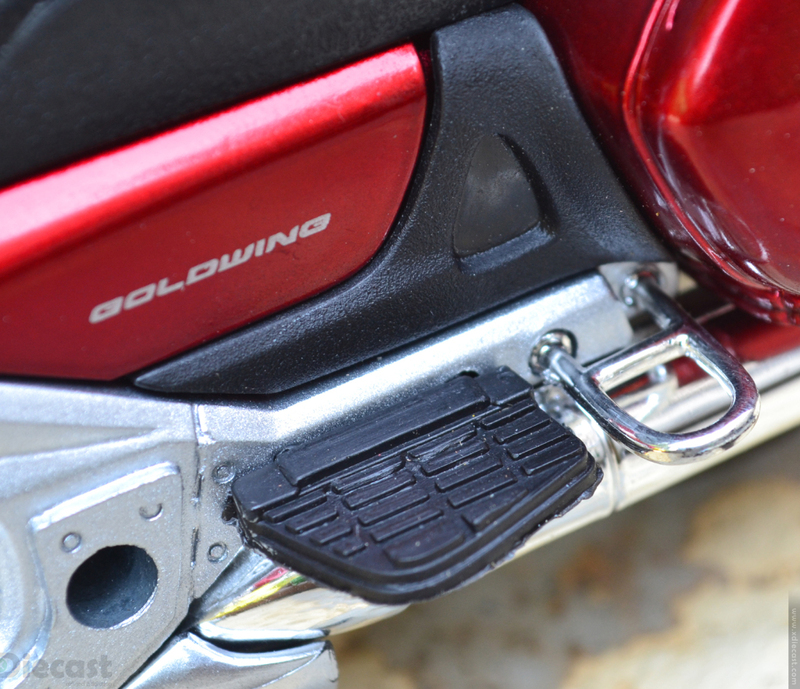 Being big come with its own advantages… the creators of the Gold Wing always wanted to more stuff into this bike so they have the chassis tough enough to hold all the gizmos and deliver good ride comfort. The same mantra is used by NewRay when they decided to make a replica of Gold Wing! 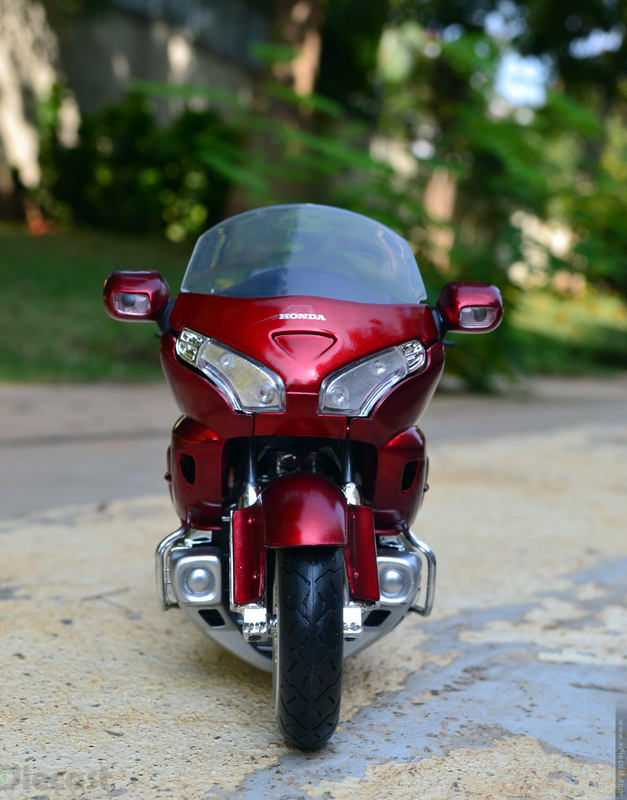 The reason I am saying this is because this one diecast motorcycle hold alot of tricks up its sleeves!! 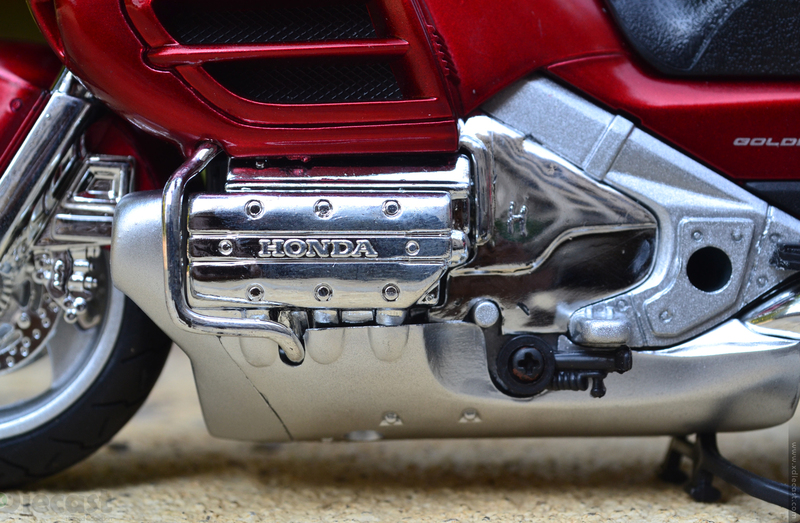 Couple of those tricks/details worth mentioning are the footrest guard in chrome finish is awesome, next up is the kick stand that are usually a plank of plastic with no details what so ever but here it holds some serious detailing and very nice(excluding the huge blackened screw)…This kick stand also work very well in putting this monster of the 1:12 motorcycle in perfect angle as is the real one. And finally the huge engine case that is finished in chrome thats so shiny grabs my finger print in no time. 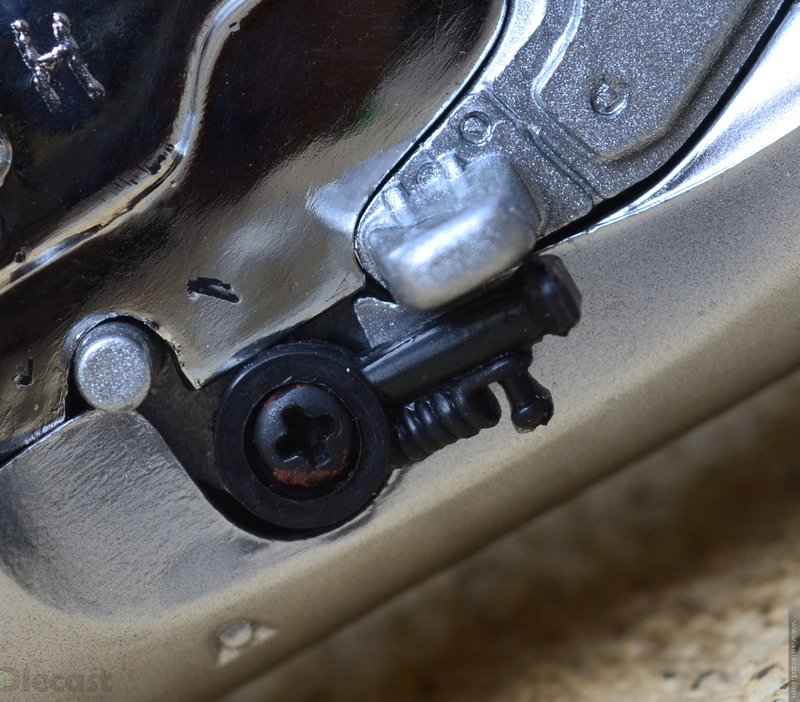 I also like the aluminum finished engine protection and the chrome guard around it. 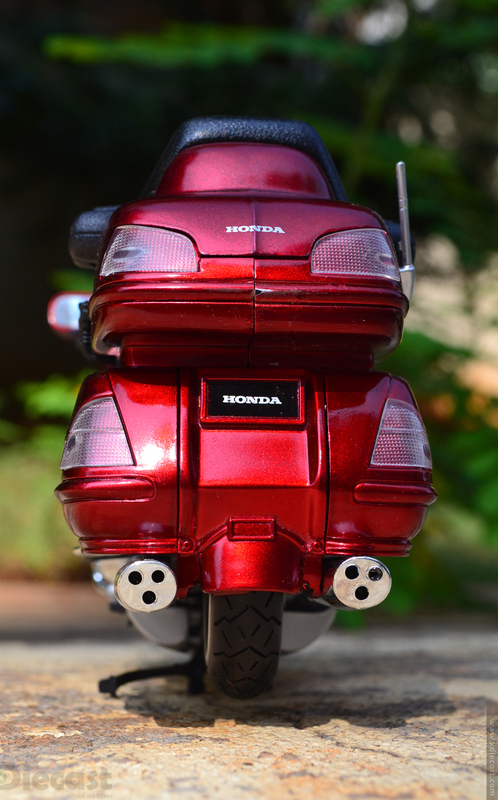 And finally its verdict time as you would have noticed that I have given this diecast motorcycle model a generous 3.5, this is because this diecast model scores high on paint finish(gloss to be highlighted), weight, attention to details and features like the fully usable kick stand etc. This diecast model scores high on glossy paint finish, weight, attention to details and features it sports!This 1:12 NewRay Gold Wing lost valuable points in finish department! Especially the missing instrument sticker, panel gaps and misfits played a big role in bring the score down! 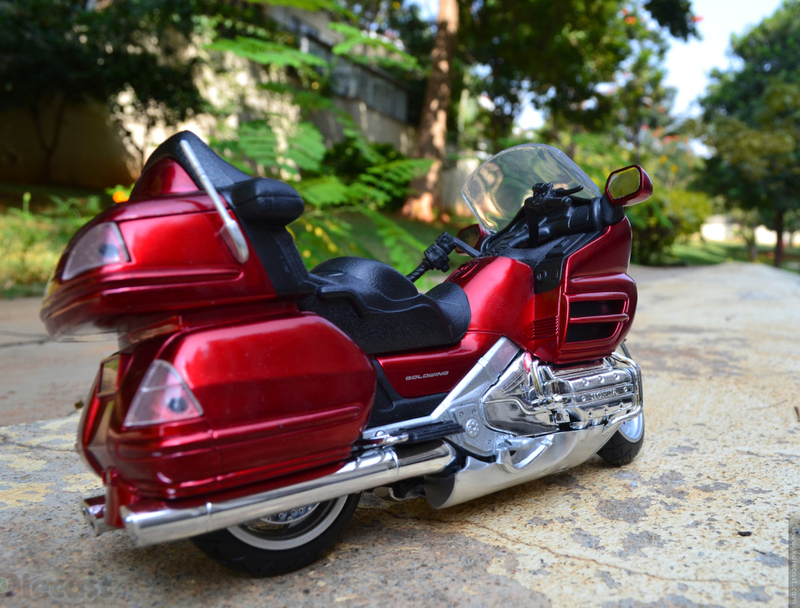 I have seem many other models of Gold Wing by the same manufacturer (NewRay) but the issue pointed here are not to be found, so I might be one of those unlucky customer to get something like this. I absolutly love this model and had plans to correct the defects as much as possible so hold on will post an other coverage soon with the correction done. 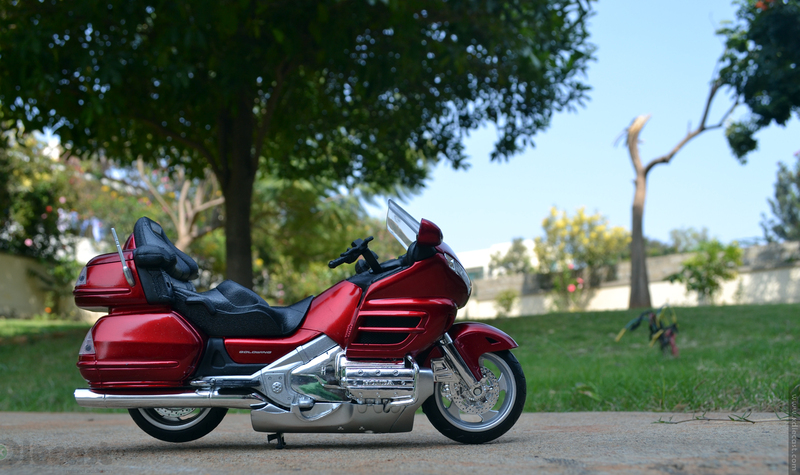 I also have plans to get an other Gold Wing and modify it to look like a trike in white like this! The exhaust tip are kind of fancy!! Thank God they look like an actual exhaust that is is found in the stock Honda Gold Wing that were made around 2010. Beautiful photo set as always! Thx Alan for your comment.